Background: The purpose of this project is to give the current r-one robots an improved capacity to interact with their environment and each other through an externally attached gripper apparatus. • Grab and move objects to desired locations. • Assist one another in moving objects that require more than one robot. • Travel in a variety of formations, including linear and close-packed configurations. Motivation: Ultimately, the r-one robots need to interact with their environment and accomplish tasks autonomously. The first step is to grant the r-ones the ability to grab onto objects. One can imagine a future scenario where thousands of small swarm robots dig through rubble after an earthquake in search of survivors. For now, the robots operate in a quasi-2D environment. As such, the gripper designs are optimized for moving and gripping objects in this simplified world. Design Notes: All black ABS plastic parts were designed in SolidWorks and fabricated using an X-660 Laser Cutter. Most assemblies used some combination of screws, nuts, nylon spacers, dowel pins, or super glue. All design files are stored here. The Mark 1 gripper is optimized for small, cylindrical objects, such as a pen or screwdriver. This gripper is comprised of three planar pieces of 1/8” ABS plastic (all prototypes use the same material). The central piece is free-rotating such that a slot and servo mechanism can open and close the gripper. The Mark 2 continues the trend of cylindrical object optimization, but small serrations increase the applied pressure and prevent unwanted rotation of an object when gripped. Furthermore, this gripper uses six layers of laser-cut plastic with dowel pins at the tips of the gripper hooks. These alternating pins allow the robots to connect to one another and move in unison. The Mark 3 features serrated and slightly curved clamps instead of gripper hooks. 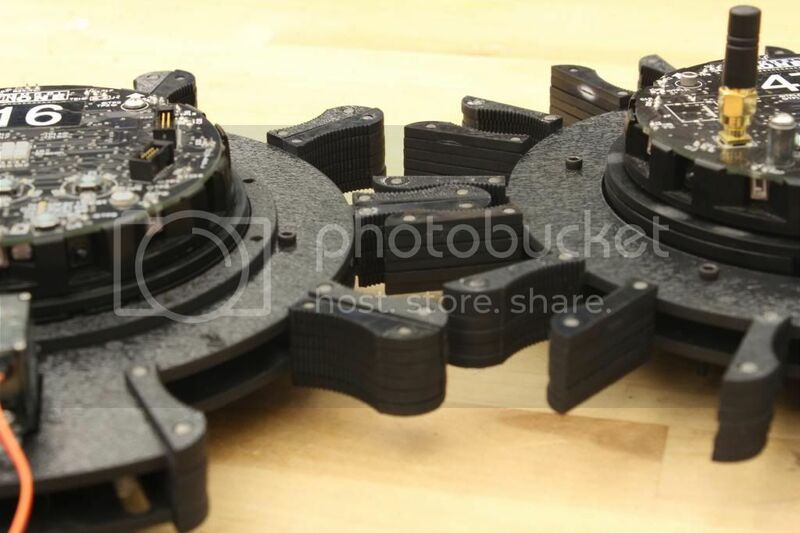 This prototype boasts a free-rotating assembly that rests on other pieces of plastic; the friction of free-rotation is minimal. The Mark 3A uses a conventional servo and slot mechanism for closing and opening the gripper, and the Mark 3B uses a pin gear assembly with a brush-less DC motor instead. 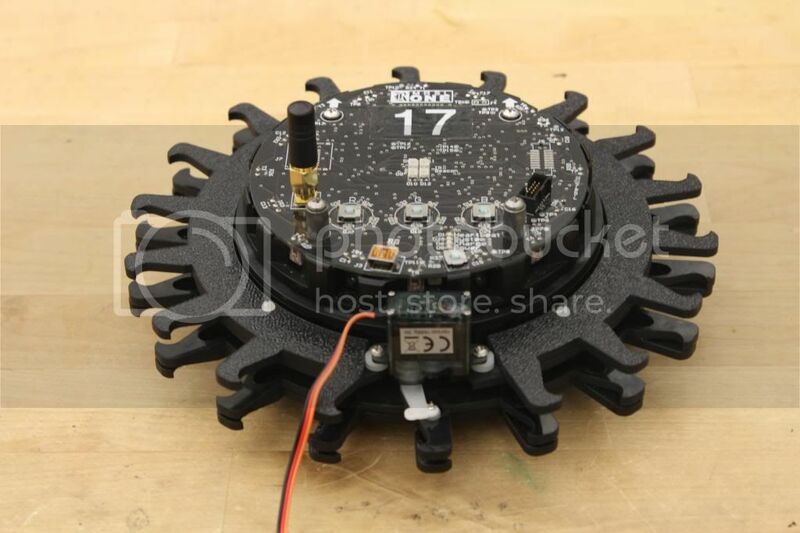 *Note: Spacer tolerances and limitations on the ring width of the bottom gripper determine the maximum radius (if this ring were too thin, the gripper pieces might snap off). 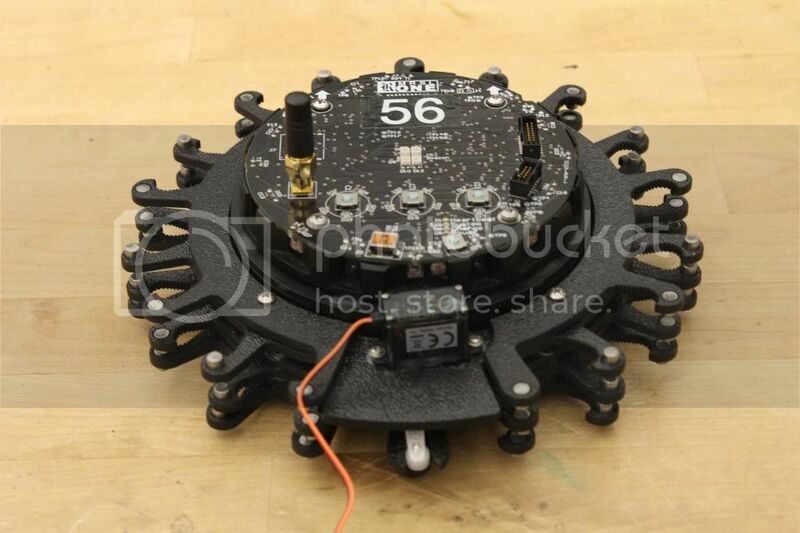 The Mark 3 will soon feature a mechanism that locks the servo or motor in the default position at the rear of the robot. This addition will also return the motor to the default position when needed.In this way, one can choose when the gripper is free-rotating or not, depending on the application. To simplify mass-production, the final design will be injection molded.